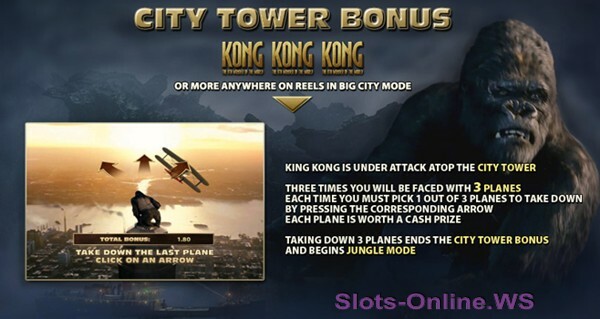 Kong - The 8th Wonder Of The World is a 5 reel, 20 payline online slot machine featuring King Kong and offering great winning opportunities with expanded & sticky wild respins, scatters, Jungle & Big City Modes, Skull Island & City Tower Bonus features. The game has released in March 2011 and now available in featured Playtech online casinos. Developed by Playtech in partnership with Universal Studios, Kong - The 8th Wonder of the World will let players re-live the drama and adventure of the beloved cinematic classic, whilst also indulging in wilds, free spins, re-spins and 2 gripping bonus games! The slot uniquely offers 2 playing modes, Jungle and Big City, each recapturing the excitement and breathtaking spectacle that is Kong. Each playing mode offers a different set of special features. 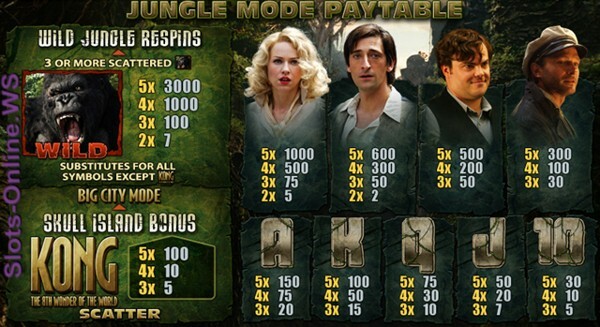 The game starts in the Jungle Mode, and the mode changes each time you finish a scatter-triggered special bonus feature. Kong offers a range of coins for every budget from $0.01 up to €/£/$5.00 coins that results in up to 200 coins or up to an incredible €/£/$1,000.00 bet per spin. 36 winning combinations are available on the reels with a top jackpot in the base game of 3,000 coins when you hit 5 wild Kong symbols on activated payline. Other winning symbols include cinematic characters Ann Darrow, Jack Driscoll, Carl Denham and Captain Englehorn, plus Ace to 9 card symbols. Wild: The King Kong symbol is wild and substitute for all other symbols to form winning combinations except for scatter Kong Logo. Scatter: When 3 or more Scatter Kong Logos occur anywhere on the game screen, an additional win from 5x to 100x total bet is awarded and added to your payline winnings; plus the Skull Island Bonus round is initiated. Jungle Mode features a Skull Island Bonus round where you need to match up 3 identical animals on an island in order to win a prize. If that animal happens to be King Kong himself, you will end up winning a great cash prize. The Jungle will also feature a Respins logo symbol which will freeze every wild Kong symbol that is spun until the bonus feature comes to an end. The City Mode is obviously set in surroundings very similar to New York. The Tower City Bonus round is triggered by the player spinning 3 or more Kong logos scattered anywhere on the screen. You are given control of the great beast as he looks to ward off a host of fighter pilots from the top of the Empire State Building in one of the movie's most iconic scenes. Take down 3 different fighters to win prizes. There are also Respins features in both City's and Jungle modes, although it works slightly differently in 2 different modes. When you're in the City mode, the first respin leaves the reels 1 & 5 wild. The second respin will leave the second and fourth reels wild whereas in the third respin, reels 1, 3 and 5 will be expanding wilds. During the Wild Jungle Respins round the Kong wild symbols become Sticky Wild symbols, that hold their positions on the reels for the remainder of the bonus round. Kong is a great new video slot with quality graphics and some unique, highly entertaining bonus features. Download the slot machine game or play instantly on a casino site below. Casino Tropez (review) - Up to €/£/$3000 free including 100% match bonus up to €/£/$200. Titan Casino - €/£/$4,000 in welcome bonuses, including 100% bonus up to €/£/$200 on your first deposit. Penguin Vacation - Free Spins 20 Line Slot from Playtech. Happy Bugs - Bonus Feature 20 Line Slot from Playtech. Farmers Market - Bonus Feature 20 Line Slot from Playtech. Funky Monkey - Classic Slot Machine. Tiki Island - Bonus Feature 20 Line Slot Machine. Houdini Slot - Bonus Feature 25 Line Slot Machine. Playtech Released 3 New Great Slot Games: Kong, Iron Man 2 And Top Trumps Celebs. Featured Playtech online casinos (EuroGrand, William Hill Casino..
Meet Kong The 8th Wonder Of The World In The New Slot Game At Playtech Online Casinos. 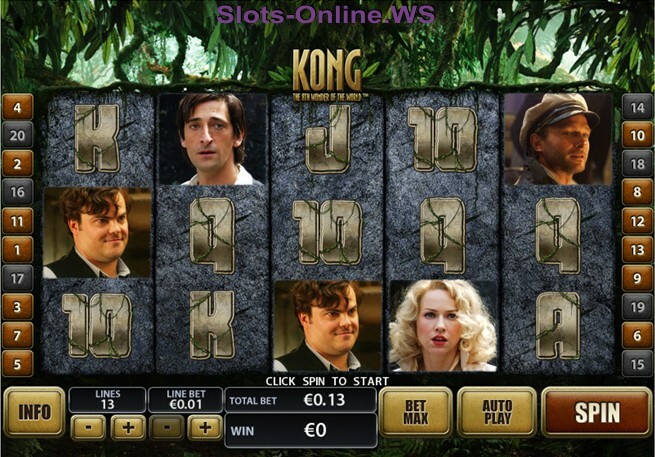 We are thrilled to announce that the new Kong slot machine..